A B.Com (Hons) 2011 batch graduate from DU, Abhinav Jerath has worked as a freelance photographer right after school & went full time after completing college. Abhinav is presently a freelance photographer, videographer & video-editor. 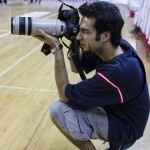 He is also the official photographer for the Basketball Federation of India (BFI). His photos can also be accessed here.